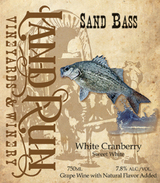 This wine bursts with sweetness, a unique white cranberry blended with grapes. The elegance awakens your senses and palate to fruity aromas. This wine is very easy to drink and it will have you at the bottom of your glass before you know it. Pairing: Enjoy this wine with fresh salads, grilled chicken, or pulled pork sandwiches, Sushi or spicy ethinic cuisine, crème brulee, cannoli, or poached pear tart. Serve chilled. This wine is perfect for backyard barbeques and sharing with friends.